Always on the go? Got some time to burn between meetings? Kids pining for their favorite shows away from home? live content all from your mobile device—FOR FREE! All you need is a TDS TV subscription, a high-speed Internet connection and device, and a TDS email address. Go to tds.net and log in. Click TV & Movies at the top of the screen. Either search for what you’d like to watch, or explore the menu bar options—Live TV, Shows, Movies, and Networks. So, visit tds.net and go check it out now. Channels like AMC, ESPN, Hallmark, History, Bravo, TBS, and TNT, plus many, many more are now available. Check back often as new channels are continually being added! TDS launches fiber services in Oregon, Wis.
Can I watch things from my DVR? I wish I could but it doesn’t seem like I can. Will there be a smartphone app anytime soon for TDS everywhere? I tried to sign in for FOXNOW but TDS is not listed as a provider. What gives? Frank, we’re actively working to get TV Everywhere and video-on-demand content from Fox. We don’t know yet when an agreement will be in place, but it’s in the works! Is there any update on an app? I tried TDS CatchTV but it bombed out saying it couldn’t find a streaming device, whatever that means. Travis, CatchTV is for our cable customers only. If you’re a TDS TV customer, it’s not going to work. But, the good news is, an app for TDS TV should be here this summer! I don’t have a exact date yet, but most current timeline has it coming in the next few months. Jeffrey, our contract with The Sportsman Channel expired December 30, 2016. We are constantly evaluating our channel lineups, so if Sportsman Channel programming is something you would like to see return, I would encourage you to fill out our channel request form at https://tdstelecom.com/shop/tv/channel-request-form.html. I want to watch Fox News but you aren’t a provider, will you become one soon? Hi Nick! I checked in with our TDS TV team and I’m being told it will be very soon. So, the answer to your question is YES :-). Why can’t I watch most of my channels on my Roku?? Says not authorized to view content, What’s up with that????? Hmmmm, that is odd. If you have access to the network in your channel package, you should be able to authenticate through the provider’s app within the Roku. If you’ve refreshed a few times and you still can’t get in, please call in so we can troubleshoot with you (888-225-5837). What channels can I watch live? 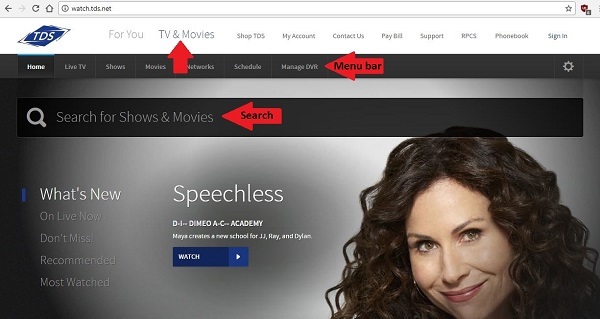 There are a couple of ways to see what you can stream with TDS TV. If you visit http://watch.tds.net/networks#allchannels, you’ll see which channels are available for streaming (as noted to the right of the channel name). Or, another option is to head to https://tdstelecom.com/shop/tv.html to find your channel line-up. That lists what channels are specifically available on TDS TV Everywhere where you live, but everyone has access to ABC, CBS, Fox and NBC too. I hope this helps! I should be able to watch EVERYTHING that comes through my box, such as live Atlanta Braves games. But I cannot. Why? I have paid for it!! Todd, unfortunately it’s up to the content provider to decide what they want show and give access to as part of their TV Everywhere offerings. I cannot see the choice to watch LIVE TV when I log in on iPhone or iPad, but I CAN on my computer. Do I need to do something on those devices to stream live ???????? The “Live” category is not available within the mobile browser because the quality of live viewing on a mobile device is much better when you download and log in using the content provider’s app. You can certainly get to the available live content by selecting content through the “Networks” or “Shows” categories, but the experience is not recommended. Stephanie, did you happen to spot our new blog that lists all of our current On Demand offerings? https://blog.tdstelecom.com/tv/tds-tv/pop-quiz-how-much-video-on-demand-does-tds-tv-offer/ And please don’t hesitate to fill out a Channel and Feature Request form (https://tdstelecom.com/shop/tv/channel-request-form.html) and let us know what else you’d like to see added to the list.